If you’re in the market for new Toyota models or used cars in Rhode Island, you’ve come to the right place. 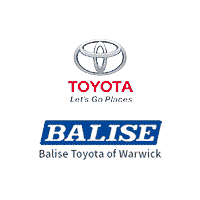 At Balise Toyota of Warwick, we serve Warwick and the surrounding areas in Rhode Island. We’re here to provide customers with the cars they want and the service they need. But it’s more than that. We want to bring you the best car buying experience so we make sure you’re a priority each time you visit us. And we’ll tell you just how we do that. At Balise Toyota of Warwick, we know that quality almost always trumps quantity. But, since we provide only our best new 2018-2019 Toyota models to drivers from all over Providence, Pawtucket, North Kingstown, & Cranston, RI, we figured: why not both? That’s why we carry a huge selection of quality, reliable new and used cars, and why we are proud to be a two-time winner of the Toyota President Award, a prestigious honor among the Toyota community.